One of our favourite breakfasts (and a great mid-afternoon snack, too). 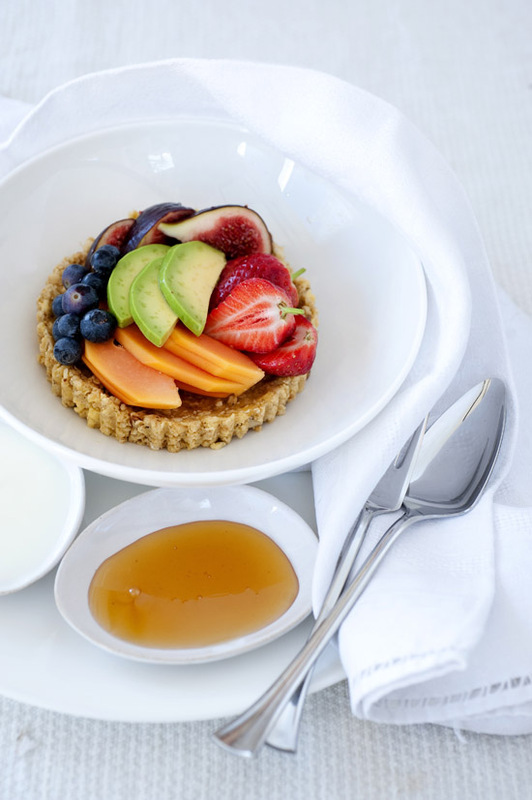 We offer a fresh fruit, yoghurt and muesli or granola breakfast to our hotel guests – but there’s a small twist: it comes in the form of a tart. This is a fun way of presenting it a little differently and new guests are often surprised when it arrives at the table. It’s one of our signature dishes. Combine 250g of your favourite muesli, granola or toasted rolled oats with 100ml soft butter. Line a loose-bottomed French tart pan (small or large depending on the size you want to serve) with enough clingfilm so that it hangs over the sides. Spoon the muesli and butter mix into the base and press down firmly. Fold the clingfilm over towards the inside to cover the tart and place in the freezer. When ready to use, remove from freezer and carefully remove from pan. Slide the tart base out of the clingfilm onto the plate. Allow to thaw for about 10 minutes. Top with yoghurt and fresh fruit and vegetables and drizzle with honey. Garnish with fresh herbs or edible flowers and serve.